I still play Sims on my iPad. Usually, at night when I can’t sleep. I finished the puppy quest. I now can buy puppies and kittens. Yay! A few months later, they had a baby girl. They sold a lot of the den items and turned it into a nursery. Meanwhile, their friend, Miller, had a new baby of his own. A beautiful kitten named Jack. Miller was convinced his kitten would be the next internet star. Tobias’ household had a new addition as well. A greyhound puppy named Goodball. Tobias wanted to train the puppy a little before introducing him to his son, Sam. Tobias was hoping the puppy would cheer up Sam. Ever since Sam’s mother had passed away from cancer, he had been quiet and kept to himself. Tobias felt better playing with Goofball and hoped his son would as well. Tobias’ dad still enjoyed bonding with the elderly Potatoes, a German Shepard from a rescue facility. Their bond was so strong it could pass through doors. Cookie and Grace enjoy some patty cake time, cat style. Meanwhile, it seems that the vampire couple are having a bit of fun. Babies? We’ll have to wait and see. 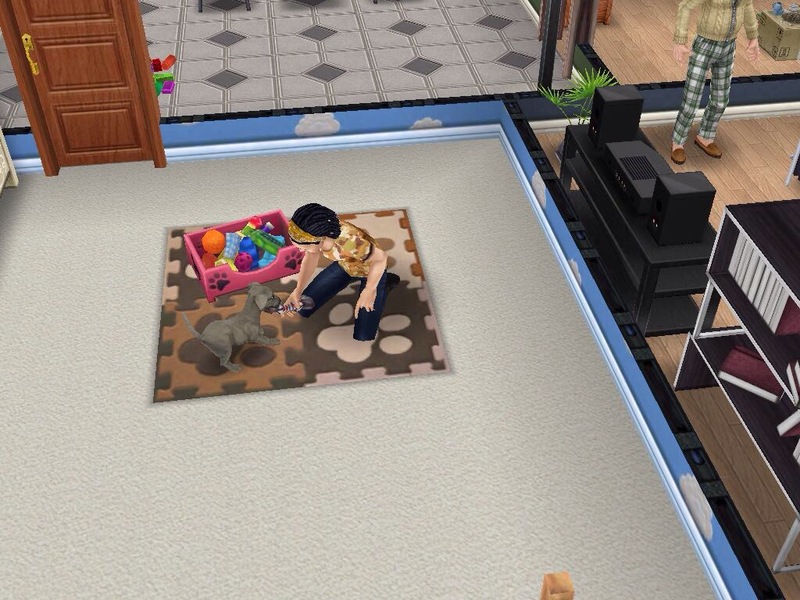 London and Dean already have a teenage son,two cats and a parrot. Could they handle another addition to the household? London’s an artist, loves cats and Dean who is a ghost hunter. They divorced after their son’s 14th birthday. London felt that Dean wasn’t around much and maybe even had a love interest on the side. They reconciled after much talking and remarried. One thing that keeps me from playing this game is that the higher rank your town, the more simoleons you need. I have several not built places because I would have to fork over 850,000 for one building. Irritating! I would love to build some new stuff but I’ve never been able to save up enough simeoleons. Sometimes, I don’t play for 4 days in a row and I get messages saying the town misses you. When I log back in, I will occasionally get free lifestyle points or free simoleons. Yippee! 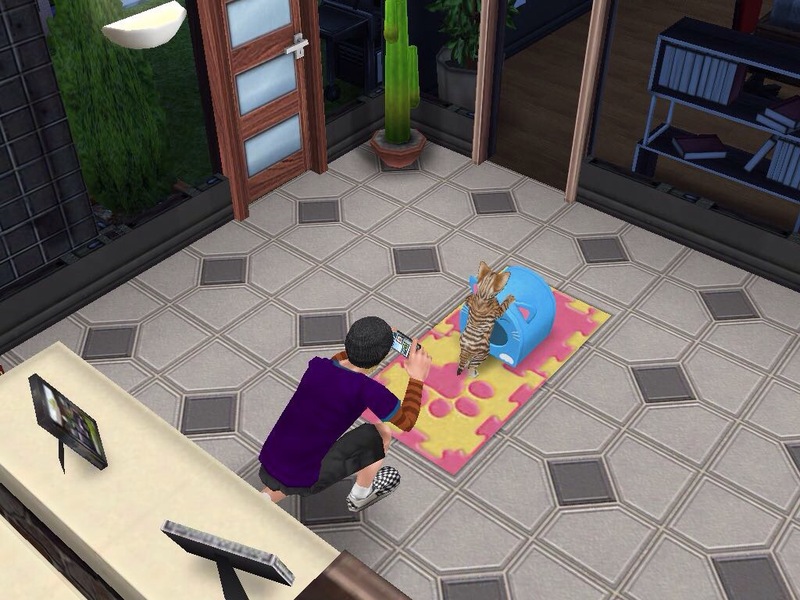 I do like the new baby, toddler and baby animal interactions. I’m going to try to sleep..it’s 1:30am here. Happy Simming! My man, Guy, painting a pop art umm masterpiece. Ok, so it wasn’t a masterpiece but it was deemed “great”. You like my original name, Guy? I had a brain fart while coming up with a name so Guy. Oh wait, I know where that name came from, when I lived in Colorado, my roommate’s name was Guy except he pronounced it Ghee. “Mmm, this grilled cheese obviously needs some salt.” Luckily, he didn’t drop the salt shaker in the pan like some Sims. Time to play Foosball cause you know, it’s always time to play Foosball. I wanted to see how long they would play and left them. 3 Sim hours later and still playing. “How long do I have to play this dumb game?! ?” They both had no foosball over their heads – just didn’t show up in the pictures. “GET OUTTA MY BED, WEIRDO!” I don’t understand; they were friends. Surely, he could’ve let Guy have a nap. I finally bought a store and stuck a few of Guy’s paintings for sale. Baldy stared at it for quite awhile but did not buy it. Sadly, no one bought that painting. One week till surgery! *quietly freaking out* I’m going to attempt to play Guy for awhile…maybe have him start a family. It looks like the guy with the red hair is displeased with my Sim getting into the hot tub with coffee. It’s strange how a Sim will get into a bathtub or hot tub with a drink. I can’t make them do that. I would if I could. Thinking to self: “I can do this.” He did with lots of sweat and grunting. “Say, cheese!” I don’t think this guy is too excited to have his picture taken. His eyes say cheese but he’s not smiling. I haven’t been playing Sims 4 or Sims 3 lately. Why? Well, I bought a couple of old games (Uncharted 3 and Borderlands 2) and have been obsessively playing both. I have a few Sims pictures left over to share with you. The Sims are from families that I started but haven’t played in awhile. For the past few months, I haven’t been able to play past generation one with any of my Sim families. Too tired and forget what my Sims were working towards. I blame my forgetfulness on chemo. It’s been 7 weeks since my last chemo but I’m still affected. Apparently, it’ll take longer than I thought to get over chemo. I’ll be glad when all this cancer stuff is over so I can rest up and get back to Simming. Surgery is coming up soon then radiation. Then, I’ll be done except for routine check-ups. Does anyone have the Movie Hangout Stuff yet? Is it any good? I’ll probably end up buying it anyway. I’ve gotten obsessed with buying all the Sims 4 and Sims 3. I don’t have all of the Sims 3 content, yet. Also, just so you know, I don’t always spend real money on the games. I use Bing rewards to get Amazon gift cards. It takes awhile but I’m ok with that (sometimes). Sometimes, I can’t wait and I’m like, aargh I’ve got to have it now! Sports massage looks painful. He came in uncomfortable from sore muscles and was happy when he left. Say Cheese! 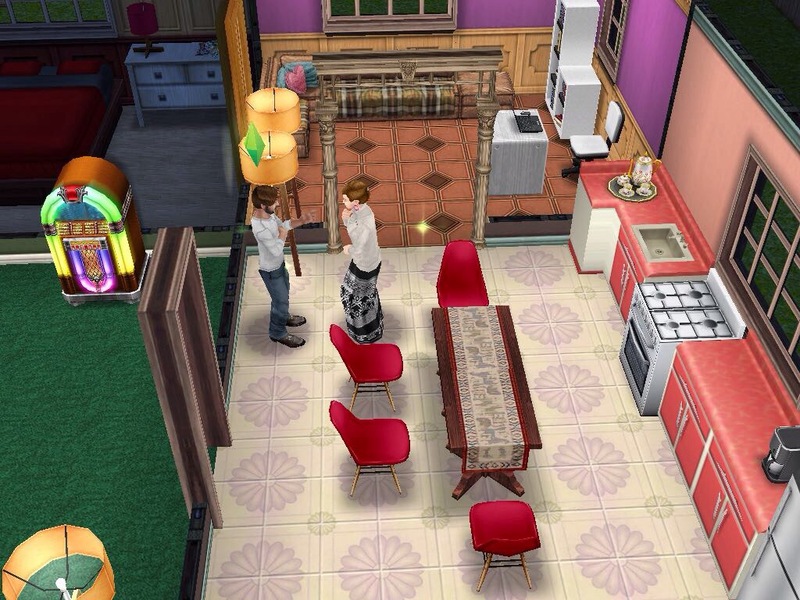 Why isn’t the Sim who took the picture showing up in the mirror? I like how she sprung out of bed when her dad walked in the room. She’s supposed to be doing homework but she has the lazy trait and took a nap instead. I decided that I’m not very good with building houses. I usually download from the gallery or add-on to whatever house my Sims have moved into. This latest house remodeling made my kids laugh so I thought I’d share it. I did put it in the gallery: VampCatz (my id). I literally just stuck two rooms on top. I did use cheats to unlock career promotions and objects from “Get to Work” pack. Second floor with walls down. My kids thought the grassy area was funny. I kind of like the grass up there. The bush poses a slight problem – my Sims wish to “fertilize” the poor thing. Workout area with a random easel. Guitar may or may not be included. I can’t remember. I’m thinking he just pulled it out of his back pocket and started playing. Secret study area – behind bookcase. Not really a secret since everyone who visits immediately goes in there. Even if they have never been to the house before. Last shot. Bathroom – had to have the shower. That’s how I house build. I suppose I really remodel more than build. I just noticed that coffee cup on the floor. Who put that there? They couldn’t make it to the sink or the dishwasher? They just put it in on the floor and left. I have a feeling it’s the Sim who is working out. Coffee usually makes them energized. I’m still playing Sims 4 and sometimes Sims 3. I’m leaning towards liking Sims 4 since the Get Together pack came out. Happy New Year (again)!